Chaffetz has subpoenaed all of the 302's from the FBI, including Combetta's, after that FBI agent told him he could go through FOIA if he wanted. Congress does not have to go through FOIA to get information like this. The FBI seems to be hindering Congressional investigation and/or delaying it till....when? After Nov. 8th? After Jan. 20th? 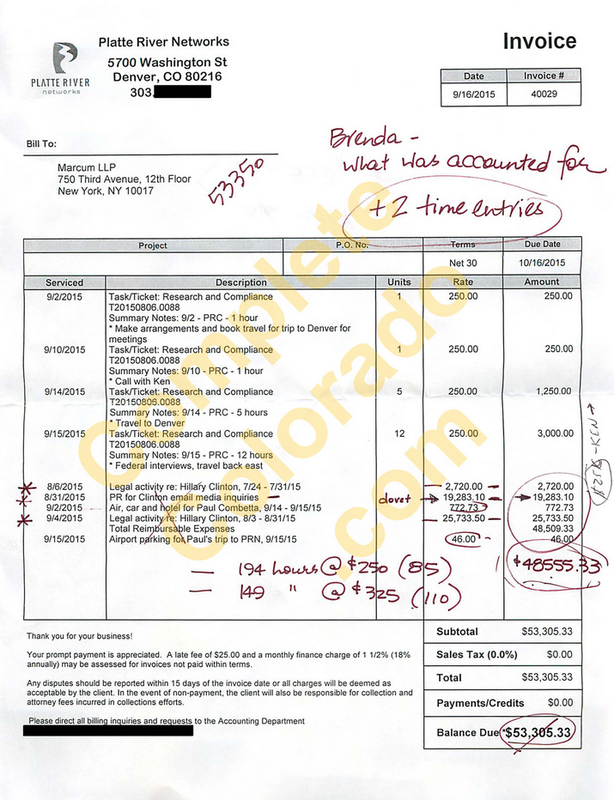 Why in the hell would they charge $19283.10 for "PR for Clinton email inquiries," and $25733.50 for "Legal activity re: Hillary Clinton..."
Despite Boian’s statement that Platte River set up a 30-day revolving retention policy for Clinton’s emails, Johnson’s letter noted that Platte River employees were directed to reduce the amount of email data being stored with each backup. Late this summer, Johnson wrote, a Platte River employee took note of this change and inquired whether the company could search its archives for an email from Clinton Executive Service Corp. directing such a reduction in October or November 2014 and then again around February, advising Platte River to save only emails sent during the most recent 30 days. “If we have it in writing that they told us to cut the backups,” the employee wrote, “and that we can go public with our statement saying we have had backups since day one, then we were told to trim to 30 days, it would make us look a WHOLE LOT better,” according to the email cited by Johnson. The above bolded and underlined statement is another way of saying that they were instructed to delete data (emails) from the back up. Note the date of "Legal activity re: Hillary Clinton..."
This is indeed the actual invoice to which your excerpt is referring. It was sent to the Clinton accounting firm. I am tired of hearing that Combetta was granted immunity because the FBI investigation was about getting to the "big fish." No big fish was indicted and, in fact, Combetta's immunity simply allowed him to take the fall for criminal wrongdoing so the "big fish" could skate free. The FBI appears so very dirty now. More importantly, what power do Congress have to enforce the subpoena? If the full set of files are not delivered without redactions, what can they do? That's exactly how it seems and is why I believe the immunity deals were always part of the damage limitation in this case. Now the question becomes, if the House did request those documents, why is the FBI doing there best to not let Congress see them? Doesn't this seem fishy to you? Quick note on this. I heard an interview with several legal analysts and former FBI guys when the FBI handed over the Clinton interview notes.. They were saying that the FBI turning over investigation notes (interview notes) for a case that is not moving forward is unusual and sets a dangerous precedent. The idea that an investigation does not lead to an indictment, but the investigation and various interview notes are made public means that witnesses would be less willing to cooperate and speak freely in the future. It was a very unusual exception for the FBI to make investigation notes public in a case that is not being prosecuted or going to trial. You can think it is political, but I think it is policy. Them handing over the interview notes on Clinton was highly unusual and likely due to the unusual circumstances, but many inside the DOJ disagreed with Comey on the move. The "they" bit might warrant them handing over further notes, but the committee has to be specific in the request...not give us everything you have. Another note: It is no secret in DC that Comey does not like Clinton, nor does a lot of the higher-ups in FBI. If he could hang anything around her neck, he would do it, but he is very much a by-the-book, law, order and rules guy. Give him a solid case and he would prosecute her. That is why I find the whole conspiracy around Comey or the FBI covering for Clinton silly. That Oversight committee has every right to ask for all the 302's pertaining to this case, regardless of what the FBI's precedence is. That committee is doing work for The People through OUR House. It is their job to do exactly what they are doing and they should not have to go through a FOIA process to get it done. If you want to do shady stuff on the Internet, cover your tracks. Otherwise, you’ll end up like Paul Combetta, whose careless mistake just added new fuel to the never-ending controversy over Hillary Clinton’s missing emails. Let's see if anyone else picks up on it.